2017 is here. A new book with new pages. Let’s write a bestseller. The truth is that most of us will fail. In fact, neuroscience shows that 88% of New Year’s Resolutions fail. The reason for such failure stems from multiple reasons but one of them being the sheer disconnect with the short-term and long-term. That is, the yearly goals we set in the beginning of the year cannot stand alone. It needs to be integrated into something bigger – your life-long goal. 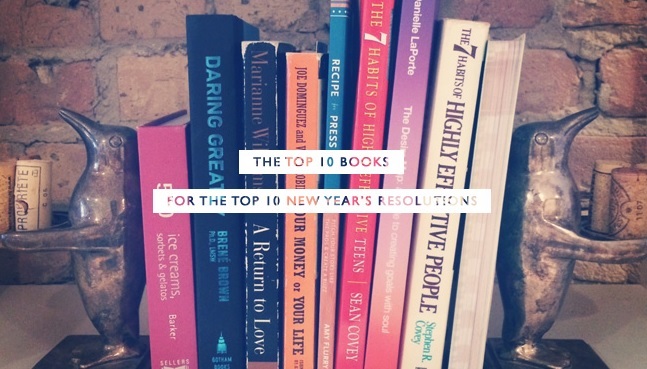 I hope these following 10 books will help you keep your resolutions. Most people spend most of their time in quadrants 1 and 3, while quadrant 2 is where quality happens. “Doing more things faster is no substitute for doing the right things,” says Covey. He points you toward the real human needs–“to live, to love, to learn, to leave a legacy”–and how to balance your time to achieve a meaningful life, not just get things done. One of the best books change. Wall Street tech leader shares wisdom on how small behavioral changes lead to major self-improvement. Whether trying to lose weight, save money, or get organized, we’re always setting goals and making resolutions but rarely following through on them. Small Move, Big Change is Arnold’s guide to turning broad personal goals into meaningful and discrete behavioral changes that lead to permanent improvement. A microresolution is easily kept and designed to nail a self-improvement target exactly and deliver benefits immediately. While the traditional resolution promises rewards on a distant “someday,” a microresolution rewards us today by instantly altering our routines and, ultimately, ourselves. In The Power of Habit, Pulitzer Prize–winning Charles Duhigg takes us to the thrilling edge of scientific discoveries that explain why habits exist and how they can be changed. Distilling vast amounts of information into engrossing narratives that take us from the boardrooms of Procter & Gamble to sidelines of the NFL to the front lines of the civil rights movement, Duhigg presents a whole new understanding of human nature and its potential. At its core, The Power of Habit contains an exhilarating argument: The key to exercising regularly, losing weight, being more productive, and achieving success is understanding how habits work. As Duhigg shows, by harnessing this new science, we can transform our businesses, our communities, and our lives. Based on Stanford University psychologist Kelly McGonigal’s wildly popular course “The Science of Willpower,” The Willpower Instinct is the first book to explain the new science of self-control and how it can be harnessed to improve our health, happiness, and productivity. The Willpower Instinct combines life-changing prescriptive advice and complementary exercises to help readers with goals ranging from losing weight to more patient parenting, less procrastination, better health, and greater productivity at work. The Willpower Instinct explains exactly what willpower is, how it works, and why it matters. In his latest bestseller, Atul Gawande shows what the simple idea of the checklist reveals about the complexity of our lives and how we can deal with it. The modern world has given us stupendous know-how. Yet avoidable failures continue to plague us in health care, government, the law, the financial industry—in almost every realm of organized activity. And the reason is simple: the volume and complexity of knowledge today has exceeded our ability as individuals to properly deliver it to people—consistently, correctly, safely. We train longer, specialize more, use ever-advancing technologies, and still we fail. Atul Gawande makes a compelling argument that we can do better, using the simplest of methods: the checklist. Based upon his weekly Harvard Business Review columns, 18 MINUTES clearly shows how busy people can cut through all the daily clutter and distractions and find a way to focus on those key items which are truly the top priorities in our lives. Bregman works from the premise that the best way to combat constant and distracting interruptions is to create productive distractions of one’s own. Based upon a series of short bite-sized chapters, his approach allows us to safely navigate through the constant chatter of emails, text messages, phone calls, and endless meetings that prevent us from focusing our time on those things that are truly important to us. Mixing first-person insights along with unique case studies, Bregman sprinkles his charming book with pathways which help guide us — pathways that can get us on the right trail in 18 minutes or less. Stop doing busywork. Start doing your best work. Are you over-extended, over-distracted, and overwhelmed? Do you work at a breakneck pace all day, only to find that you haven’t accomplished the most important things on your agenda when you leave the office? The world has changed and the way we work has to change, too. With wisdom from 20 leading creative minds, Manage Your Day-to-Day will give you a toolkit for tackling the new challenges of a 24/7, always-on workplace. Featuring contributions from: Dan Ariely, Leo Babauta, Scott Belsky, Lori Deschene, Aaron Dignan, Erin Rooney Doland, Seth Godin,Todd Henry, Christian Jarrett, Scott McDowell, Mark McGuinness, Cal Newport, Steven Pressfield, Gretchen Rubin, Stefan Sagmeister, Elizabeth G. Saunders, Tony Schwartz, Tiffany Shlain, Linda Stone, and James Victore. Plus, a foreword from Behance founder & CEO Scott Belsky. Most of us have no idea what’s really going on inside our heads. Yet brain scientists have uncovered details every business leader, parent, and teacher should know—like the need for physical activity to get your brain working its best. How do we learn? What exactly do sleep and stress do to our brains? Why is multi-tasking a myth? Why is it so easy to forget—and so important to repeat new knowledge? Is it true that men and women have different brains? In Brain Rules, Dr. John Medina, a molecular biologist, shares his lifelong interest in how the brain sciences might influence the way we teach our children and the way we work. In each chapter, he describes a brain rule—what scientists know for sure about how our brains work—and then offers transformative ideas for our daily lives. Medina’s fascinating stories and infectious sense of humor breathe life into brain science. You’ll learn why Michael Jordan was no good at baseball. You’ll peer over a surgeon’s shoulder as he proves that most of us have a Jennifer Aniston neuron. You’ll meet a boy who has an amazing memory for music but can’t tie his own shoes. The legendary Eat That Frog! (more than 450,000 copies sold and translated into 23 languages) provides the 21 most effective methods for conquering procrastination and accomplishing more. This new edition is revised and updated throughout, and includes brand new information on how to keep technology from dominating our time. The legendary productivity expert shows how getting things done leads to mental rewards that can take us to great heights in our lives. Tracy’s ability to collect the best productivity ideas is only part of his genius. Besides displaying his inimitable tone and impeccable pacing, the audio is another showcase for his palpable optimism about individual possibilities. The sound of Tracy’s voice doesn’t just bring his ideas–it makes you want to put them into action. Anchored in the idea that doing the hard task first (frog eating) makes the rest of the day more productive, the program is a tidy overview of Tracy’s best thinking on time management and life organization.